Found this confusing meal on thisiswhyyourefat.com and can’t wrap my head around it yet. I don’t know if this thing is disgusting or genius. I guess that’s why they say there is a thin line between genius and insanity. 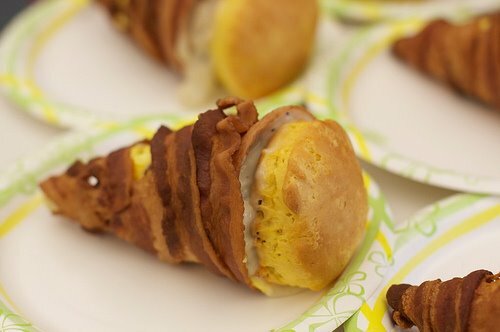 The Bacone – A bacon cone filled with scrambled eggs and country gravy topped with a biscuit. As always, leave any opinions, comments or hatemail in the comments section. This entry was posted on May 7, 2009 at 2:43 pm and is filed under The Bacone. You can follow any responses to this entry through the RSS 2.0 feed. You can leave a response, or trackback from your own site. How is that possibly gross?? I don’t know. I guess I just feel like it’s something you eat and then immediately regret. There are so many wonderfully awesome jokes I could make with that statement. To limit them to one would be doing a disservice to all. And to list them all would offend the sensibilities of everyone who reads this site and get me blackballed from ever posting on it again. Well lucky for you we a) only have four readers, and I don’t think A. Young gets offended easily, and b) we have no idea how to block users. c) we had a post last week entitled “Don’t Be a Douche”. A “that’s what she said” is perfectly reasonable.